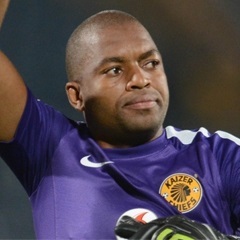 Cape Town - Kaizer Chiefs goalkeeper Itumeleng Khune has posted his frustrations on Twitter after being sent off during the Amakhosi's 1-0 Absa Premiership victory over AmaZulu at the Peter Mokaba Stadium on Thursday. With mere minutes of the match to go, Khune was shown a yellow card after referee Phillip Tinyane adjudged he had been wasting time. Khune, who had gone to fetch the ball, was not happy and showed dissent at the decision, and was shown a second yellow less than a minute later. Bernard Parker gave Chiefs the three points with the only goal of the match in the 18th minute. Chiefs stretched their lead atop the standings to 10 points with five matches to play. After the game Khune took to Twitter to vent his anger, suggesting the PSL take action against officials who make the wrong calls. “Its about time action is taken against this referees by @OfficialPSL. They've been very poor since beginning of the season", tweeted Khune. Its about time action is taken against this referees by @OfficialPSL.they've been very poor since beginning of the season.??????? ?